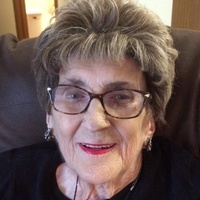 Margaret “Marge” T. Kourajian, 90, passed away Thursday, April 11, 2019 at the Heritage Centre, Jamestown, ND. Margaret was born November 29, 1928 on a farm in Ashland Township, the daughter of Boleslaw and Leokadiya Cebula. She attended school in Buchanan, ND. Marge married Raymond “Ray” Falk on September 23, 1952 at Sacred Heart Catholic Church, Fried, ND. They lived in Oriska, ND, Valley City, ND, Wimbledon, ND, and Courtenay, ND before moving to Jamestown in 1976. They raised two children, David and Janet. Ray passed away December 14, 1991. On April 30, 1993, Marge married Charlie Kourajian at St. James Basilica, Jamestown. Charlie passed away May 19, 2018. Over the years Marge worked for Dr. Weber, JC Penney’s, Jamestown Hospital, and Gladstone Inn. Marge will be remembered as a loving and caring mother, step-mother, grandmother, and great-grandmother. She was a friend to all who knew her. She had many, many coffee and lunch friends. Marge is survived by her son, David (Fay) Falk, Jamestown; daughter, Janet Falk, Fargo, ND; four step-children, Barb (Bud Fisher) Kourajian, Brooksville, ME, Steve Kourajian, Harvey, ND, Kevin (Peggy) Kourajian, Sartell, MN, and Beth (Kyle) DeFault, Fargo; two grandsons, Jason (Tania) Falk, Jamestown and Tyler Falk, Jamestown; twelve step-grandchildren; and four great-grandchildren, Tommy Falk, Katie Falk, Ella Falk, and Lucy Falk, Jamestown. She was preceded in death by both her husbands; her parents; five brothers, John, Alex, Sam, Ralph, and Bob Cebula; and six sisters, Cecelia Cebula, Helen Cebula, Rose Campbell, Sue Sorenson, Marian Wilma, and Leona Thomas. Vigil: 7:00 p.m., Monday, April 22, 2019 at Good Shepherd Chapel, Ave Maria Village, Jamestown, with a Rosary beginning at 6:45 p.m.
Mass of Christian Burial: 10:00 a.m., Tuesday, April 23, 2019 at St. James Basilica, Jamestown, with Monsignor Jeffrey Wald officiating. Interment: St. Boniface Cemetery, Wimbledon, ND.